Rev. Robert Palladino, whose work as a master calligrapher influenced a young Steve Jobs and subsequently the typography of Apple's first Mac computers, died on Friday at the age of 83. 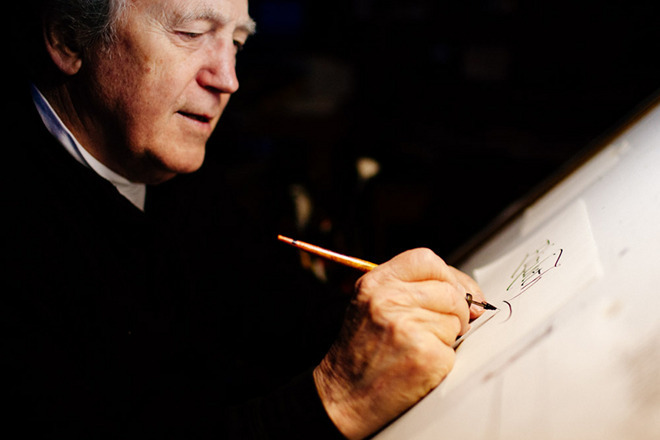 Father Palladino, a Roman Catholic priest who learned the art of calligraphy as a Trappist monk, inspired the transformative typefaces used in Apple's first machines, and by extension the modern personal computer. Prior to Mac, computers and operating systems used fonts and typesets that boasted all the artistic appeal of an IBM punchcard. As reported by The New York Times, Palladino met Jobs during his tenure at Reed College in Portland, Ore., where he taught calligraphy from 1969 to 1984. Jobs audited Palladino's class after dropping out from Reed in 1972. In his 2005 commencement speech at Stanford, Jobs talked about the impact Palladino's teachings. None of this had even a hope of any practical application in my life. But 10 years later, when we were designing the first Macintosh computer, it all came back to me. And we designed it all into the Mac. It was the first computer with beautiful typography. If I had never dropped in on that single course in college, the Mac would have never had multiple typefaces or proportionally spaced fonts. And since Windows just copied the Mac, it's likely that no personal computer would have them. If I had never dropped out, I would have never dropped in on this calligraphy class, and personal computers might not have the wonderful typography that they do. Of course, it was impossible to connect the dots looking forward when I was in college. But it was very, very clear looking backwards 10 years later. While not mentioned by Jobs, Palladino was consulted on the creation of Mac's first Greek letters. In an interview with the National Catholic Register in 2012, Palladino looked back on his time with the tech guru, saying, "He took my class and became very interested in letter forms. [...] He came back a year or so later and said he was interested in my Greek alphabet." While he had a hand in shaping the personal computing revolution, Palladino never once owned or used a computer, The Times said.